ZIMBABWE – He had just started finding his feet in Zanu PF’s cut-throat politics because he had spent most of his professional life representing Zimbabwe in Russia, Botswana and South Africa, among other countries in a diplomatic career that began with a posting to Mozambique in 1987. Fourteen months ago Vice-President Phelekezela Mphoko was an obscure politician in Zimbabwe. After his surprise elevation to deputise President Robert Mugabe alongside Emmerson Mnangagwa, many expected him to use his diplomatic skills to douse the flames engulfing Zanu PF. But the man who has lived at the plushy Rainbow Towers Hotel since his appointment has been nowhere close to being a diplomat. His propensity to put his foot in the mouth has left many asking questions about Mugabe’s choice. Unlike Mnangagwa, whose political track record is well-known within the Zanu PF circles having served as a Cabinet minister in various portfolios, Mphoko was an unknown figure until his name popped-up as the party’s factional wars heightened. He had been recalled from South Africa where he was the country’s ambassador and his name started to feature prominently in the media as he launched his campaign for the vice-presidency. Within six months as VP, he dressed down Psychomotor minister Josiah Hungwe, telling him to stop addressing him as the “second vice-president”, declaring he was equal to Mnangagwa. “Before I proceed, I would like to make a point of correction to Cde Hungwe,” Mphoko said in May 2015. Mphoko added, “We only have one first secretary of the party, who is President Robert Mugabe, and two second secretaries of the party, who are the vice-presidents, so I wanted to make that correction”. To show that he is a legend of controversy, the VP has had several more gaffes, with the most recent one being his comments at a rally in Chiweshe. While introducing the First Lady, Mphoko made what many viewed as a tribal statement. He claimed that there were people insinuating that since Mugabe was a Zezuru, it followed that a Karanga would succeed him. “There is nowhere in our Constitution where it is written that this country was liberated by a Karanga, a Ndau, a Zezuru or a Ndebele,” he said. “What we hear now that President Mugabe is a Zezuru and if he steps down a Karanga should take over is not what we fought for. That is a Rhodesian mind. Don’t lose sleep over statements by some excitable people because there is nothing like that. “We have party ideology and if you jump away from that, you risk being hit by landmines out there. You will die, it’s your fault. Don’t say I have not warned you. So, let’s not fool ourselves thinking that the position of president is up for grabs by everyone,” he said. That statement later caused a tribal backlash. But before that, he had commented on the explosive Gukurahundi issue, suggesting that Mugabe should not be blamed for the 1980-1987 mass killings in Matabeleland and Midlands provinces. In an interview with a State controlled newspaper last year, Mphoko said Gukurahundi massacres –which left over 20 000 people dead in the 1980s — were a Western conspiracy. Angry opposition parties and activists called for his resignation over the utterances. His views also appeared to have affected the cordial relations that he enjoyed with his party comrades such as Higher Education minister Jonathan Moyo, who took exception to his Gukurahundi utterances. “As President Mugabe has said, Gukurahundi was a ‘moment of madness’ and that is the bottom line. There’s no need for confusion on this,” Moyo posted on micro-blogging site Twitter in response to the blundering VP. As if that was not enough, during his tour of the country, Mphoko angered vendors when he said he did not understand why able-bodied people engaged in vending. Activists and opposition parties said the VP should have addressed the reason why many people were vending, instead of attacking those who were working to earn an honest living. 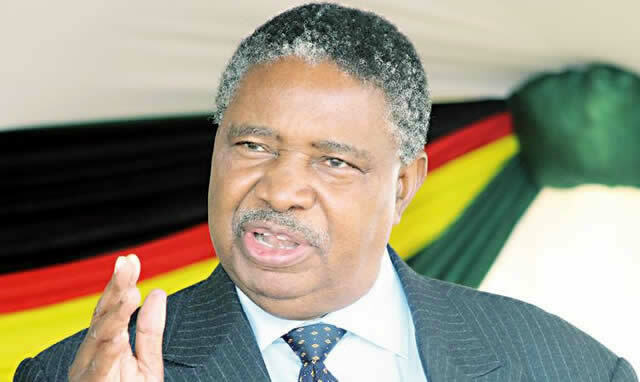 Besides the political gaffes that he has made, Mphoko has also made himself a target of criticism by most Zimbabweans after he allegedly refused to occupy a house that was previously used by former Vice-President John Nkomo, demanding his own house. For more than a year, Mphoko has stayed at a top hotel in the capital spending in excess of $280 000 of the tax payer’s money. Political analyst Enerst Mudzengi said Mphoko had been trying hard to make a name for himself, hence some of the controversial statements. “He is trying to find a trade-mark and in the process [he is] making numerous blunders. Remember, he is a man with no constituency to talk about. He has never won an election, hence he is doing all sorts of things, appearing at all rallies by [First Lady] Grace Mugabe in the hope that he will get some backing within the party,” Mudzengi said. University of Zimbabwe political science lecturer, Eldred Masunungure said Mphoko should learn government procedure and political language. “He lacks maturity when compared to Mnangagwa. He needs to master what to say and what not to say,” said Masunungure.